The other day Tricky posted about his seed problem and listed all the seeds he had. 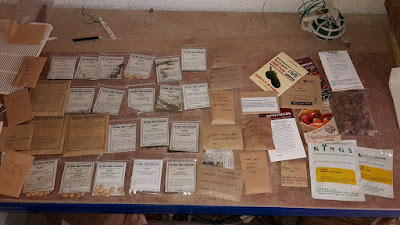 Well this week my seed order turned up and I was really excited to see them all laid out. I've tried to put my money where my mouth is this year and I've bought all non-hybrid, open pollinated varieties (except one variety of sweet pepper I thought my daughter would like and a few F1's from previous years - sweetcorn & a couple of types squash). I've also tried to buy the vast majority of my seed from The Real Seed Catalogue. I've mentioned them before on this blog and I know many of you already buy seed from them, I just feel that their ethos matches (or betters!) mine and I want to grow seeds that are produced in this country rather than China or Thailand and are adapted to a climate similar to mine. 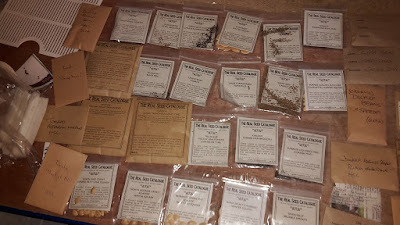 I did get a nice selection from the seed swap earlier in the month as well and of course I've bought seeds from a few other places as well, I always see a variety that I like the look of or there are some things I want to plant in bulk. Carrots and beets that I can never grow enough of, so I use a couple of wholesale sellers that sell bigger packs of seeds (Kings and Moles seeds are both quite good for this). I do think I've probably gone a little bit over board but I know I'll end up planting most of them. I seem to have a lot of squashes and dwarf french beans, both great veg to grow and eat, but hopefully I'll start selling a few veg this year and I want to keep experimenting with growing staples that produce large amounts of the calories that we need. As well as this I have the rest of my seeds organised into 12 separate boxes that I group by either family or how I plant them. I'll put up my planting plan next week if anyone would like to see it - I have at least 30 beds to organise and I think it might even be more than that by the time I'm finished setting up this year! I don't have many vices but this is certainly one of them! Who else buys or collects far too many seeds? I've got not only an embarrassing seed problem but poultry as well. Seeds are an intoxicating mix of dreaming, hope and fun. Plus they're cheap and you end up with groceries. I justify it that they're cheap - maybe not in the amounts I buy though! I LOVE seeds---such potential for a couple of bucks. There are definitely worse vices one could have. There are certainly worse ones but this one shows no sign of stopping. the first stage is admitting I have a problem though! last year I just planted "set ups" i.e. the plant was already growing in a kind of web container, and I just planted the whole thing, container and all. This year I have some seeds a friend from Virginia sent me, and I am going to plant those. Trying to grow some herbs as well. Sounds like a good plan. Herbs area great thing to grow, many are perennial and can really make simple dishes taste amazing! Make sure you grow what you really like eating, that's a key way to keeping interested in it I think! Well, If I am writing here, it can only mean one thing, I've finally caught up to date after starting your blog from the beginning. Thank you so much for sharing your story up to this point, looking at the strawberry cake you've come a long way from the "Peppa Pig after the spit roast" days and would make a fair living as a cake decorator, if you didn't have your carpentry skills. I'd love to be able to join in with the seed swaps and develop my own addiction, but alas I live in a flat with unsecure communal space, so growing outdoors isn't an option. I do however have a south facing kitchen window that is begging to be utilised. Any suggestions, I'm thinking of at least 1 chili plant and maybe some herbs. Well I'm impressed and amazed. Considering I've written over 800 posts that's no mean feat! I think I would have given up long before getting here! A chilli and some herbs sounds like some great plants for a window sill. I'll tell you what I'll even send you the seeds for it! I'd go for a cayenne pepper or a small spicy one if you like it really hot, some basil, and quick growing herbs like corriander that you could sow and then cut the lots and then sow again. And maybe some electric daisies to amaze any visitor you have over. You could grow some perennial herbs in the communal area, like rosemary (the herb I use the most) some big pots of mint (they could even be dug in the grown to stop anyone pinching them) and some thyme pushed in a few nooks and crannies. Yeah i'm trying to increase my security through my seeds. I'm joining a seed saving group which I hope will be really interesting as well as making sure that we're saving seeds from each major food group. Trying new things is what keeps it interesting, but sometimes I do try a few too many things at once!